On Monday the British TV broadcaster, Channel 4 screened Inside Britain’s Israel Lobby, a devastating expose of the Jewish lobby in the UK*. ‘We couldn’t find a conspiracy’ affirmed Peter Oborne the Daily Mail’s political commentator behind the film. He was right. After running the show for so many years, the Jewish lobby’s purchasing of British politicians and media presence is in the open. The Guardian reported today that two years ago a controversial study by American academics Stephen Walt and John Mearsheimer explored the influence of the Israel lobby over US foreign policy “but Britain's pro-Israel organisations have been subjected to far too less scrutiny.” This is indeed the case, and as Oborne disclosed, both British politicians and Zionist pressure groups enjoy it to the max. In the film Sir Richard Dalton, a former ambassador to Libya and Iran, said: "I don't believe, and I don't think anybody else believes these contributions come with no strings attached." I would suggest that ‘strings attached’ is a very gentle way of putting it. ‘Chained to submission’ would be far closer to the truth. Seemingly a British, consensus case against Zionism and Zionist infiltration is piling up. The Jewish community is not happy at all. After so many years of setting the tone, bribing UK politicians and controlling the BBC they are used to being untouchable. Labor MP Denis MacShane, who operates as the House of Common’s UK equivalent of the ‘anti defamation league’ told the Jerusalem Post "if there is a Jewish /Israel lobby here, it is not very effective, as Israel is almost treated as a pariah state in the media and has few friends in politics." I would assume that if there was any public respect left for the British Parliament, British political parties and the BBC, it should be gone by now. Just a few months ago Brits were devastated to find out about their MPs' personal expenses bills. Yesterday they learned about their leading politician’s affiliation with the darkest possible regime and ideology around. They also learned that their national broadcast corporation is influenced by Zionists pressure groups run from Jerusalem. Mark Gardner from the Zionist ‘Community Security Trust’ is not happy either. He complained that Dispatches producers behaved as if they were investigating a “criminal gang rather than various Jewish community-linked organizations,"
Gardner is also correct. It is indeed tragic to admit that the Jewish lobby is far more worrying than a criminal gang. It is there to serve a murderous state with a devastating record of crimes against humanity. 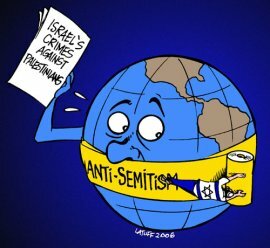 Thanks to the Jewish lobby, we are all complicit in the Zionist crime. Not only are those lobbyists heavily corrupted and removed from any ethical value system, they also corrupt everything they touch. They obviously contaminate every politician who is happy to take their shekels. Consequently they incriminate us all as a society. Watching Cannel 4’s Dispatches yesterday I wondered to myself whether this is the ‘democracy’ some British politicians, such as David Miliband insist on spreading around. I also wonder whether this is the governing model that Jewish Chronicle writer Nick Cohen and the Israeli Hasbara committee author David Aaronovitch were trying to promote when they were supporting the invasion of Iraq back in 2003. However, there is a single observation that must be added. People out there must never forget that Britain was taken into a war that cost more than a million Iraqi lives and at the time Lord Levy was the Number 1 Labour fund-raiser. Putting the two together: an illegal war that only serves Israeli interests and Sir Richard Dalton’s observation that Zionist ‘contribution’ comes with ‘strings attached’, leaves a very bitter taste. Due to its heavily corrupted politicians, Britain is now willingly serving the darkest possible racist national ideology and supporting a criminal terrorist state. British politicians and media are caught in bed with too many Zionist wolfs. In order to reclaim sovereignty and dignity, Britain must de-Zionise itself immediately.